You can attach multiple notes to a patient's record. The notes that were created or last modified on the same date are grouped together. Also, you can set up a note to appear as a notification (as a pop-up in the lower-right corner) when you access certain areas of Dentrix Ascend. On the Notes tab of a patient's Patient Information page, click (or tap) Add Note. The Add Notes dialog box appears. By default, the Date of the note is today's date, but you can change it if necessary. 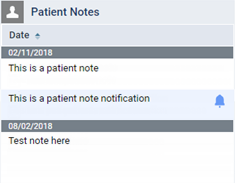 In the Patient specific note field, type any important information regarding the patient, such as a conversation you have had with the patient (in person or electronically). This note will appear in the Patient Notes box of the patient's Overview page. The note can be up to 5000 characters long. Note: To insert the current date where the text cursor is located, click (or tap) Insert Date. 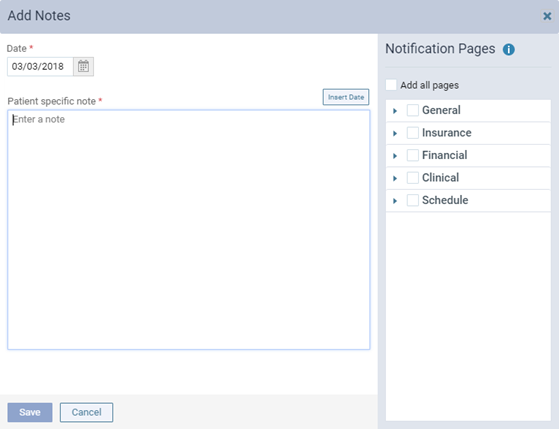 To add the notification to all available areas, select the Add all pages check box. To add the notification to only certain areas, select the desired check boxes. To select all pages within a category (General, Insurance, Financial, Clinical, or Schedule), select the check box of the desired category. To select an individual page within a category, expand the category, and then select the check box of the desired page. Note: To remove the notification from all pages in a category, clear the check box of the category. To remove the notification from an individual page within a category, expand the category, and then clear the check box of the page.